Despite having a misleading name, PMT is the one-stop-shop for budding musicians, as well as established performers and even talented air guitarists. Professional Music Technology, which boasts nine stores across the UK, is like a music shop straight out of Wayne's World. You walk in, discover a guitar you love and find yourself quoting the line 'It will be mine, oh yes, it will be mine'. When you walk through the door for the first time, perhaps with your family, maybe with your band, or just on your own, you are immediately met with the wail of an electric guitar and the rumble of a drum solo. Once inside the basketball court sized hall, you are awestruck by the abundance of instruments. They're everywhere, as if drawn here like a musical Mecca. The back wall is entirely covered with guitars, from floor to ceiling. There are at least three hundred electric guitars on that wall, ranging from the very expensive high end names and brands, to the budget beginner models, which are still beautiful axes. Scanning the range, it becomes instantly apparent that there are so many styles and colours, that it would be difficult for any guitarist to fail in finding the right guitar to suit them. And that's not all. Disregarding the guitar wall decoration, scattered around at floor level, are at least fifty bass guitars, again ranging from the top end, six stringed monsters, to the more familiar and basic four stringed basses. They even sell a couple of upright electric basses, which really turn people's heads. It's fair to say that, in every department of the store, all levels and styles of musician are catered for. 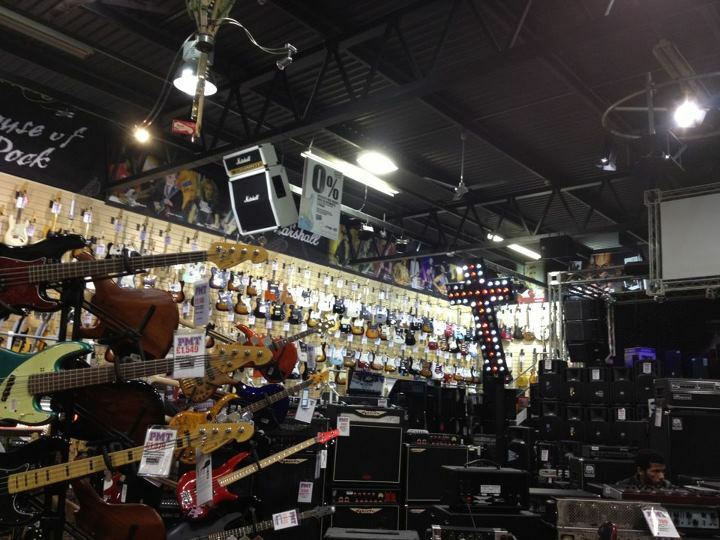 It's the experience and the atmosphere, created by the staff, that makes PMT stand out from other music stores. The staff look like rockers from throughout the ages and are both very cool and very welcoming. Hail one of them, as they bustle around the shop, and they won't hesitate before plugging in a guitar, for you to have a quick play. It doesn't matter if you're Joe Satriani or Joe Bloggs, anybody is welcome to try out the guitars. However, if you are Joe Bloggs, then never fear, because it's at this point that they prove they are not just standard sales assistants. The staff at PMT are not only extremely knowledgeable on the instruments they are selling, but are also accomplished musicians, able to demonstrate what the instruments are capable of. Just when you think you've explored the whole store you notice the stairs and follow the rumbling sound you heard upon entering. On the first floor is where the drums and percussion instruments are displayed. As you walk around the shiny acoustic drum kits and the smaller, more compact, electric kits, the staff are equally welcoming and enthusiastic. No question is too obvious and, equally, no question is too specialist. The staff advise with an enthusiasm to match your own and make you wish you had thousands of pounds to spend on becoming a rock star. Let's just say, if you have even the remotest interest in music, you'll find yourself right at home in this musicians' paradise. You can find further details and information, including opening times at this website. Go to the the Contact Us section of this site for a map of PMT's location. Why? Everybody wants to be Jimi Hendrix and this is the place to start. Where: Near the city centre.